Strawberry Fields is an indica-dominant cannabis strain created by Sagarmatha Seeds. It was derived from crossing Strawberry Cough and an indica parent with an unknown identity, although some believe it was created through crossing Strawberry Banana and Tangie Strains. Strawberry Fields has absolutely gorgeous buds. Its buds are cone-like in shape. 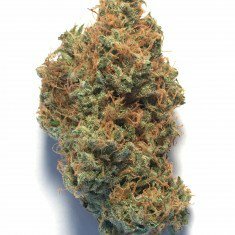 The plant has thick, light green nugs with dark leaves, plenty of bright orange hairs, and a rich coating of bright white crystal trichomes. Perfect for consumers who are obsessed with strawberry aroma, Strawberry Fields but is more soothing than the Strawberry Cough sativa. This strain boasts of a distinct strawberry aroma with plenty of sweetness and a delightful herbal quality. Strawberry Fields is recommended for seasonal cannabis users as very high doses could cause anxiety and headaches. The plant has an impressive THC profile, as it produces up to 24% of the psychoactive compound. While this marijuana strain can induce sleep, it is not one to get you couch-locked or knock you to the floor. Strawberry Fields delivers a calm yet potent relaxation. It will have you totally relaxed in a few minutes and after a few hits. Typically, users feel an uplifted sense of euphoria that engulfs the mind and body with a feeling of calm and complete ease. As the effect and happy feeling grows, this relaxing physical effect will ease into a sedated state that can cause some users to fall asleep, especially given its powerful THC level. Some people suggest that cannabis strain is a nighttime cough remedy. Smoking this herb expands the chest and improves sleep. It is quite popular in the treatment of nighttime pain and anxiety disorders and depression. It also treats asthma, bipolar disorder, and muscle spasms. Strawberry fields strain looks beautiful and tastes even better then it looks, smooth and enjoyable!! One of my all time favorite strains. Love the song too!